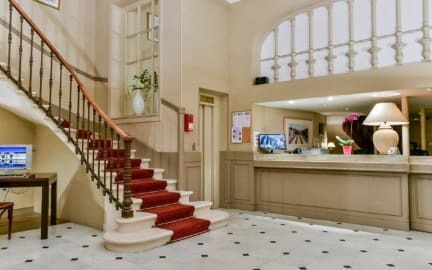 Hotel Konti by HappyCulture is a beautiful and comfortable 3-star hotel, located in central Bordeaux. The hotel offers a warm welcome in the refinement of an eighteenth-century building, and offers 50 rooms and a duplex suite with panoramic terrace, all soundproof and well equipped. For your comfort, the property offers free Wi-Fi access throughout the property and small pets are allowed for free. A continental breakfast is served daily. To give you the special Bordeaux welcome, the property organizes a Regional Aperitif., with a selection of wine and typical regional appetizers to try out. For more information, please do not hesitate to contact the property. Hotel Konti by HappyCulture is perfectly located in the city center of Bordeaux, in a semi-pedestrianized street in Bordeaux’ golden triangle in the Grands Hommes district. The famous department store Galeries Lafayette is a 5-minute walk from this hotel and close to a tram station. This charming hotel offers 50 rooms and a duplex suite with panoramic terrace, all soundproof and well equipped. Payment types accepted at this property: cash, credit card, debit card and French Cheques. Please note: Before January 2016, local tax is 1.10 euros per person per night. Breakfast not included. Extra-cost: 10 euros per person per day. Pet friendly. No extra charges. Please note: before arrival please contact the property. The maximum number of extra crib in a room is 1. The property cannot offer the possibility to add an extra-bed. Parking available. Charges may apply.